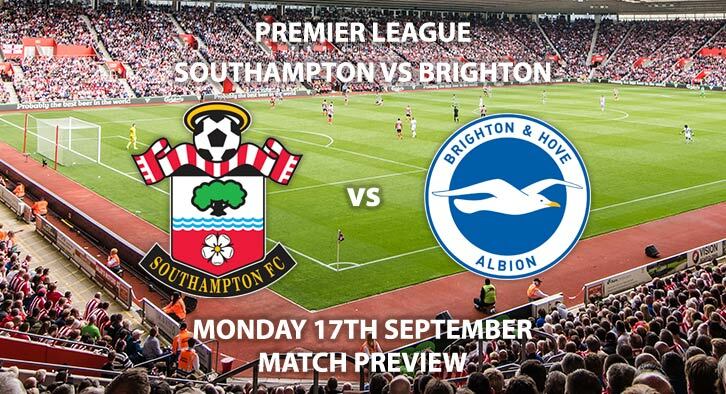 Southampton will host local rivals Brighton and Hove Albion this Monday in the Premier League. The two sides met recently in the Carabao Cup, where the Saints managed a late victory thanks to striker Charlie Austin. Both sides have accumulated four points from their opening four matches, leaving them both in midtable positions. They’ve also both won one match each and both will be wanting to make it two wins as this match is the derby of the south coast. The hosts haven’t had the ideal start to their new campaign considering they haven’t faced any of the top six clubs yet. They are EVENS on SkyBet to get a victory over their local rivals at St Mary’s this Monday night. New signings Danny Ings has already netted twice this season and looks a dangerous figure, spearheading the Saints attack. The ex-Liverpool man is priced at 4/1 to break the deadlock. His pace and dribbling skills will prove tricky against the, at times, rigid Brighton defence. In their last five outings, they’ve managed to keep three clean sheets. Southampton to win to nil is priced at 21/10. The visitors will be looking for revenge after their early exit in the Carabao Cup. SkyBet have priced them at 3/1 to do so. Albion are fortunate to have an experienced goal scorer in Glenn Murray, who has already bagged three goals this season. The 34-year-old has a knack for knowing where the goal is and is incredibly gifted in the air. The talisman is priced at 2/1 to score anytime. The referee for this match will be Anthony Taylor. Taylor has averaged 40 booking points in his 4 Premier league matches this season. With it being a local derby, expect cards. Southampton vs Brighton will be televised on Sky Sports Premier League in the UK and kicks off at 20:00 GMT. Prediction: Southampton 0 -2 Brighton. – Although SkyBet have them as outsiders, they have plenty of players who can hurt Saints defence. They often perform well away from home and in big pressure matches. Correct Score Brighton win 2-0 – (link no longer available). Correct Score Group Betting – Brighton to win 1-0, 2-0 or 2-1 – 7/2. A penalty to be scored in 90 minutes – 7/2. Scorecast Boost – Glenn Murray to score first and Brighton to win 1-0 or 2-0 – 28/1. RequestABet Specials up to 10/1 – BTTS, 4+ corners each team and 20+ booking points each team – 10/1. (NB). Popular RequestABets – Ings to score and Brighton to score a penalty – 33/1. @FootyAccums RequestABets – Over 1.5 goals, Ings & Murray 1+ shots on target each, 3+ corners each team and 10+ booking points each team – 4/1. (NAP). Odds and markets last updated on Monday 17th September 2018 @19:05 GMT. Keep checking back to see if there’s any updates to markets – the time stamp in the previous sentence for when we update tips on this page will be updated. Remember to keep visiting the tips and preview area for further updates and betting previews around this weeks upcoming European games.